Restaurants and retail shopping on a side of Newbury Street. It is an accusation too delicious to ignore. 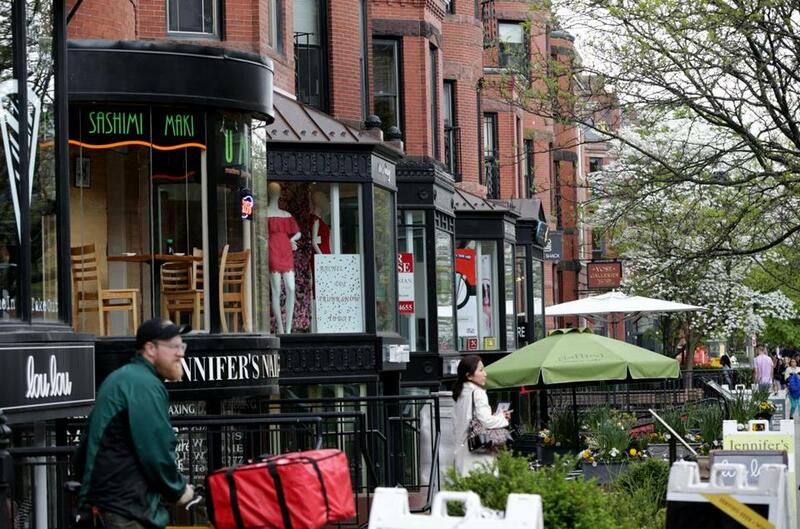 In a city exploding with hot new restaurants, Newbury Street has cooled. The supposed reason circulating around town is this: a policy that discourages new cafes from opening on the sunny side of Boston’s most fashionable street. But the story of why restaurateurs are opening elsewhere, but not so much on Newbury, is more complicated than that. The rapidly changing retail landscape is also forcing businesses to rethink Newbury Street’s future. Those who care about the Back Bay street say this: It’s not enough that the beautiful people shop there; they should also want to eat, especially as buying goods in a brick and mortar store loses its allure. “The food has not kept up with the fashion,” said Mike Jammen, principal of UrbanMeritage LLC, one of the biggest landlords on Newbury Street. The policy restricting new restaurants to the shady side of the street is not an urban myth. The Neighborhood Association of the Back Bay has long opposed allowing new restaurants on what it describes as the “north side” of Newbury. That’s the sunny side, and also the one closest to the tony condos that line Commonwealth Avenue, a block over. The influential group’s argument: Restaurants, even well-run ones, bring noise, rodents, and odors that could disrupt the lives of residents. Talk to the group’s leaders, and they will tell you their policy applies only to new restaurants; if a restaurateur proposes to take over an existing restaurant space, they will not outright fight it. In fact, the group can’t even cite the last time it resisted a proposed restaurant on the sunny side, outside of quibbling over hours of operation. Jammen paints a different picture. He says NABB’s position is so intractable that landlords like himself discourage restaurateurs from even dreaming about opening a new outdoor cafe on the north side. The Back Bay group has no legal authority, but it can raise a stink with City Hall to shape decisions. “It has come to the point now where nobody tries” to open a new restaurant, said Jammen. Let’s be clear. You won’t starve on Newbury, no matter which side of the street you’re walking on. You can break bread at Sonsie, Stephanie’s on Newbury, Cafeteria, or the Met, among others. There also are fancy fast food spots like Shake Shack and Dirty Water Dough Co.
Patrick Lyons, who has owned Sonsie on Newbury for two decades, believes that’s a problem. He wants to see more restaurants, even it means more competition for him. “One plus one equals three. People need to realize it,” said Lyons whose restaurant and entertainment empire spans more than 30 locations. Restaurants, more than stores, are what make people linger in a neighborhood. They give vibrancy to a street with al fresco dining. They’re even immune to the tech revolution — Amazon can deliver just about anything to your door, but it hasn’t yet found a way to box the experience of a nice night out. Developers in the Seaport District and Fenway have figured this out. The current Newbury vacancy rate is about 10 percent — high for a street that historically only has 3 to 4 percent of its commercial space empty. There’s a new sense of urgency among the two biggest property owners — Jamestown and UrbanMeritage — to attract unique retailers and restaurants. Meanwhile, the city will reprise last year’s summer experiment by designating car-free days on Newbury to generate a buzz. Lyons blames what’s happened on everything from landlords charging unreasonable rents to neighborhood politics. Mostly, it comes down to a lack of cooperation. 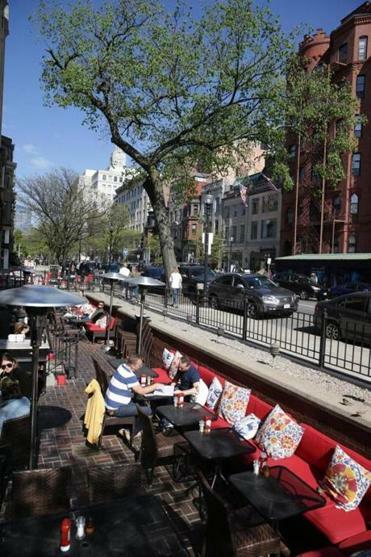 Outdoor seating — in the sun — at Met Back Bay on Newbury Street. It’s telling that when I talk with some of the city’s most successful restaurateurs, Newbury Street doesn’t come up as a place they want to be. “It’s not our group’s sweet spot,” said Garrett Harker, owner of eight restaurants, including Eastern Standard, Island Creek Oyster Bar, and Row 34. Harker has capitalized on the opportunity to be connected to the Hotel Commonwealth in Kenmore Square, and the chance to rehab an old warehouse space in the Fort Point Channel neighborhood. Then Harker launched into an explanation of why so many restaurateurs lose their appetite just thinking about operating on Newbury. It’s not just about navigating neighborhood groups, but also the astronomical rents, the cost of getting a liquor license in the Back Bay, and the lack of big open interior spaces. Chris Coombs, chef-owner of Deuxave, dbar, and Boston Chops, has also avoided Newbury — his closest restaurant is on the corner of Massachusetts and Commonwealth avenues. He offers this simple recipe for luring proprietors like him: Landlords, he says, need to lower restaurant rents and then resist the temptation to lease to retailers willing to pay double for the same spaces. Jammen of UrbanMeritage said some landlords over the last year have been trying to accommodate restaurants by reducing base rents. The most famous restaurateur who got away was Steve DiFillippo, who started on Newbury in 1985 but when rents started to soar began to look for a new home for Davio’s. By 2002, he decamped to Arlington Street by the Boston Park Plaza hotel. DiFillippo took over a 10,000-square-foot space, tripling the size of Davio’s. And it was a relative bargain. “The rent I paid on 10,000 square feet was the rent I was going to pay on 3,500 square feet” on Newbury, he recalled. DiFillippo has since built Davio’s into an empire of eight restaurants with 800 employees. Would he ever return to Newbury? “I would come back in a second,” he said. Well, some wooing may be required. Suburban malls, DiFillippo pointed out, now pay him to open up in their properties, which explains why you find Davio’s at the MarketStreet in Lynnfield and, later this year, at South Shore Plaza in Braintree. Fifteen years ago when he left Newbury, “the stores were more of the power,” he said. The neighborhood deemed cafes smelly, the source of parking headaches. Basically, they were considered a nuisance. “It’s awesome they want us back,” he said. Shirley Leung can be reached at shirley.leung@globe.com.